Well we’ve come to the end of the book. 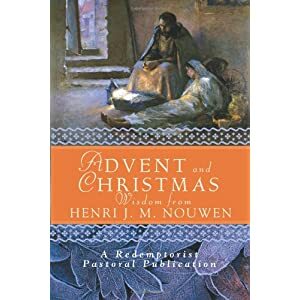 This year for Advent – and into Christmas, some friends and I have been using Advent and Christmas Wisdom from Henri J. M. Nouwen. This is not your usual Advent book. There is no following the birth narratives and prophecies, no gradual approach to Bethlehem, but rather a journey in to ourselves. We have had the chance to consider where our lives are at. Along the way, we have paused to consider not missing God in the small things, because we’re waiting for the Big Thing; waiting – for God and his time and place; being prepared to go to the lonely place; allowing God to paint our hearts; considering not just what we want to be rid of from our lives, but what things we are going to cling on to; thinking who we are called to support; finding our worth in God, rather than ‘things’; being careful about judging others; allowing our lives to be an immaculate space for God to take on human flesh; waiting for God to do his New Thing; keeping our eyes on Jesus; focussing on nothing other than the love of God; listening – really listening; those who affirm, stretch and support us; seeing God in those around us; allowing God “in”, to love us; belonging to God; laying down power; being ready; being known by God; seeing through the eyes of love; being part of community; giving and receiving forgiveness; responding to God’s invitation; God coming, as promised; surrendering ourselves to God’s future; reaching out to God; sitting at God’s feet; giving of self; travelling God’s way; not to always over-intellectualise, but sometimes to just stand and watch and wait; choosing gratitude for what we have; God’s welcome to us all; living generously; letting God have what we’ve got – however small and useless we think it is; and inviting God to cleanse and renew us. For me the most powerful was seeing through the eyes of love – learning to look at people with love, seeing the good things in them. I have also had the opportunity to allow God to touch some painful parts in me, and bring some peace. For those insights I give thanks. Thank you to them all. Thank you to all who’ve read this blog, and joined in with #adventbookclub on Twitter. I hope you’ve enjoyed the ride, and that God has blessed, challenged, encouraged and comforted you on your journey. May you know his hope, peace, love and presence through the rest of the year. My blog will continue in it’s usual, rest of the year format, of blogging on each Sunday’s lectionary readings. Do join me for that if you want to continue to explore God’s word. Pam, thanks so much for inspiring and convening #adventbookclub, especially thanks for your faithfulness from someone who did what she could when she could. I’ve gained enormously from reading your reflections and those of others, it’s been a pleasure to share Advent with thoughtful, lovely, humans! It’s truly been my pleasure.